Have you noticed that your Pinterest feed isn’t doing a good job of showing you what it is you want to see anymore? Too many ads? Not seeing pins from the people you follow? Use these tips to mold your feed into more of what you really want to see. I love Pinterest. I mean I LOVE Pinterest! You probably love it too if you’re ever looking for home decor inspiration, recipes, fashion ideas or almost anything else you can think of. BUT – I’ve noticed that my Pinterest feed isn’t what it used to be. So sad. Instead of seeing pins from the people that I follow, Pinterest now uses its Smart Feed to show me what it thinks I want to see. 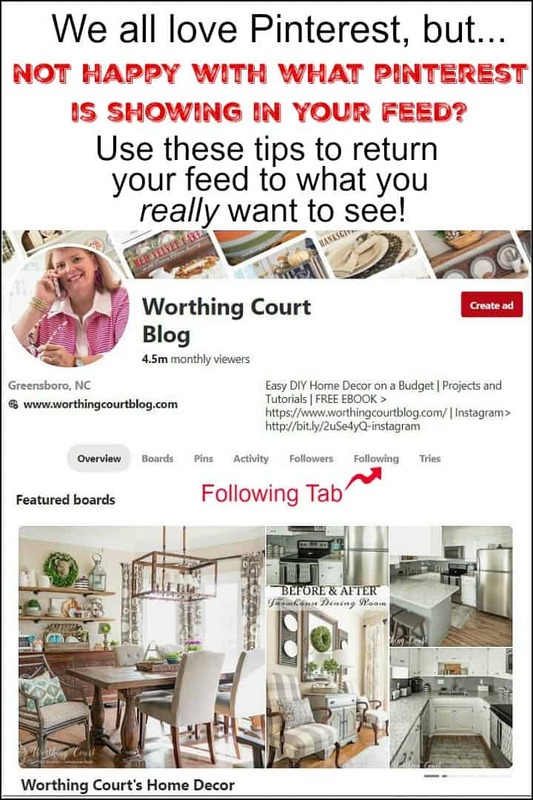 The Smart Feed algorithm is based on several factors – what you’ve searched for, what/who you’re following, what you’ve pinned lately and more. Hide pins showing in your feed that you don’t want to see. 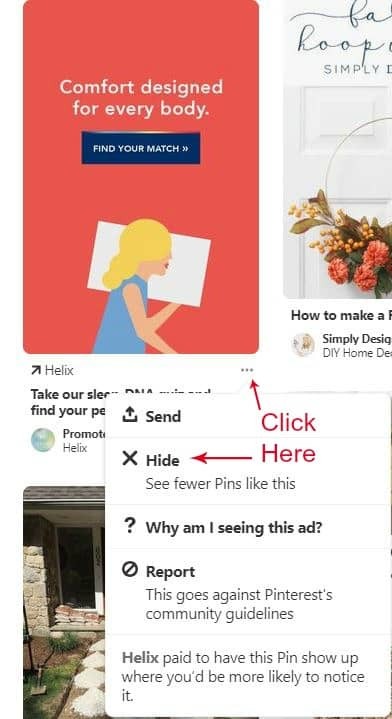 When you see a pin in your feed that you have no interest in, you can choose to hide that pin and Pinterest says it will show you fewer images like that one. For example, I have no interest in seeing a promoted pin on the subject in the pin example below (not picking on anyone in particular!). To hide it, click on the 3 dots below the image and to the right, then click Hide. I’e been doing this for a while now and I can definitely tell a difference in the types of pins that Pinterest is including in my feed. Say you’re following a blogger or brand who typically pins images that you’re interested in, but also pins about a subject that you aren’t interested in. You can still follow that blogger or brand, but simply Unfollow any of their boards that you don’t care about. 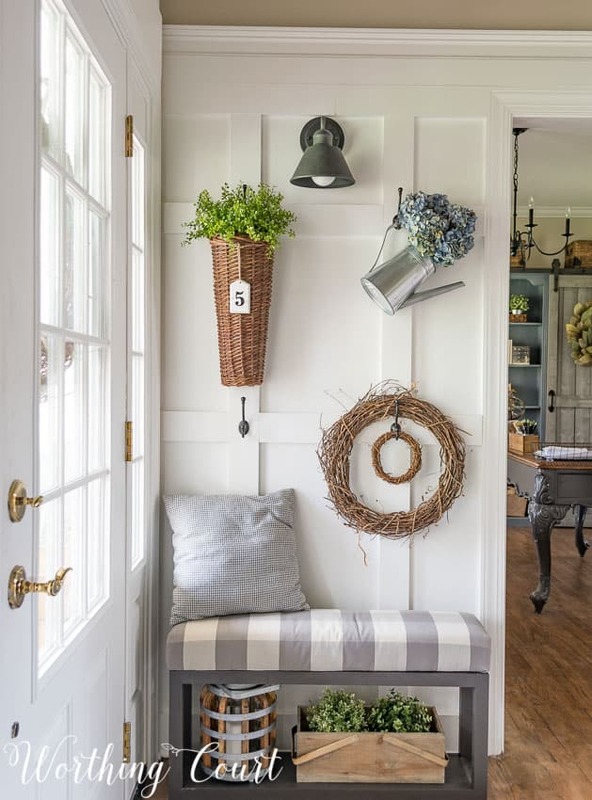 For example, maybe a person/blogger pins on boards about home decor that you like, but also has boards that pertain to a subject you aren’t interested in. Maybe you like her home decor boards, but really have no interest in her healthy eating boards. To unfollow the boards that you don’t want to see pins from, do a search for the name of the person, brand or blog to get to their profile page (again – not picking on anyone!). Click to Unfollow any boards that you aren’t interested in. If you’d rather see pins from only those you’re following, use the new Following tab. 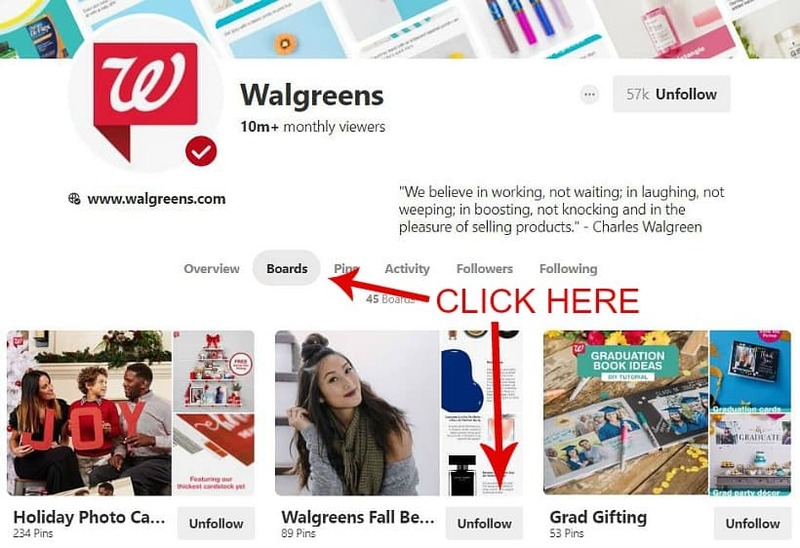 On desktop or laptop: To find who you’re following, go to your profile by clicking on your picture and user name, located in the upper right corner of the Pinterest feed page. This will take you to your profile page where you’ll see an image like my profile. All of the tabs are there – Overview, Boards, Pins, Activity, Followers, Following and Tries. Here’s a snippet from my profile page and where you can find the Following tab. On mobile – android or iphone: Download the free Pinterest app to your phone (if you don’t have it already). Make sure you’re signed into Pinterest with your user and password. Click on the icon at the bottom of the screen that looks like two heads beside one another – it may say ‘Following’ under the icon. That will take you to everyone that you’re following, in chronological order. On mobile: Click on the + button to the right of the images of people you’re following to get suggestions from Pinterest of other people you may also want to follow. In addition to People, you can also follow specific Boards and Topics. Find the option on desktop and laptop, located to the right of the list of people you’re already following. TIP: Make sure you’re actually following all of the blogs, people and stores that you actually DO want to see content from! Remember – Pinterest is paying attention! 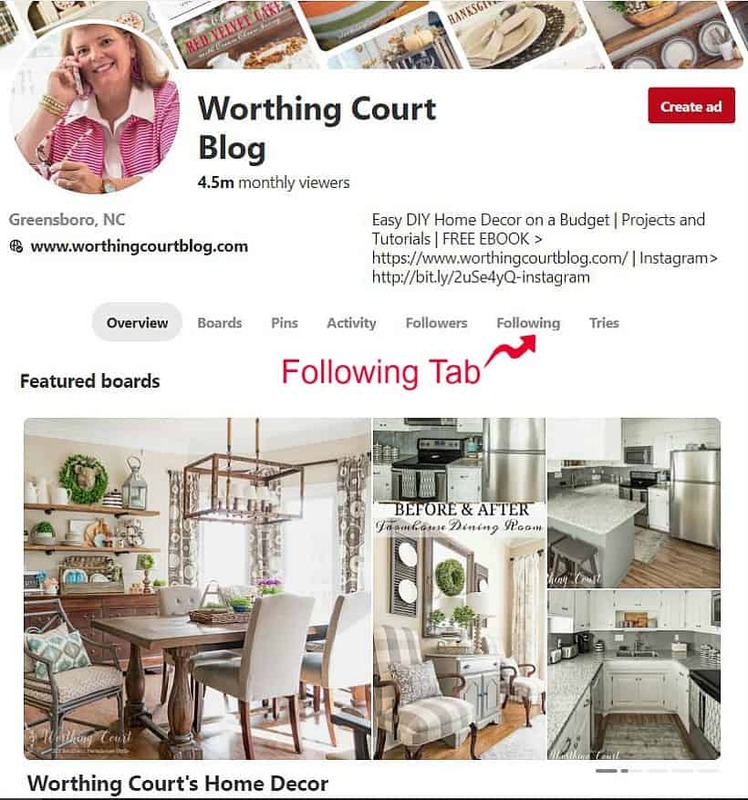 And speaking of following, I sure do hope you’ll include Worthing Court in your list of blogs to follow on Pinterest. You can do that right HERE. I have over 120 boards where I pin all kinds of great stuff – home decor, diy projects, seasonal decorations, recipes, crafts and more! If you have friends that you know have been frustrated with Pinterest too, make sure to share these tips with them! In conclusion, although we can’t control the algorithms that Pinterest uses to create a Smart Feed for each one of us (my Smart Feed won’t look like yours), these are some steps you can take to encourage Pinterest to only show you what you’re most interested in seeing. Do you have any other Pinterest tips? Leave them in the comments! Thank you! Hope you both a doing well! Thanks so much! I tried this on Facebook as well. Hopefully it will get rid of some of the ads! Hopefully it will! Facebook is just outta control it seems like. Thanks so much for this information! It’s such a terrific, helpful post! Glad you found it helpful, Teri! Thank you for sharing this! I haven’t been on Pinterest much lately because it seems like it’s just one ad after another. I know what you mean! I hope these tips will help you. Thank You, So Much. My time spent on Pinterest has gone from everyday, several times a day, down to only a couple times a week. Now I can begin to enjoy it again!! Hi Carol. I know a lot of people just like you and even know some who won’t even use Pinterest anymore. Hope these tips will help you out! Great tips. I love Pinterest, but I don’t seem to be getting the variety that I used to get. My feed seems to consist mostly of things relating to the last few things I have most recently pinned. Hi Sharon. What you’ve recently pinned seems to have a very strong impact on what they show you. If I pin one recipe, it seems like my feed is suddenly filled with mostly recipes. Thank you, Julie! Just replied to your DM. What an amazing post! Thanks for putting the work into it. Glad you liked it. Hope you found some useful tips! Thank you Suzy, great info!!! Hi Jenna. Hope you found it helpful! Thank you for the great information. Since the change, I hardly ever look at Pinterest. Maybe Pinterest can be good again using your tips. This was great! I’m going to my Pinterest page right away. There were some pins that keep showing up and I am not interested in them at all! Thank you for taking the time to post this great info! Glad you found it helpful! Happy pinning! Thanks for the info, I get so tired of the uninteresting ads,etc. Love to follow you and all of your ideas that can apply in anyone’s home. Blessings. Hope you found the info useful. Happy to have you following along and I’m glad to know that you think my ideas can apply in anyone’s home. That’s the whole idea behind inspiration – right? 😀 Blessings to you as well! Hi Tara. I hope these tips work well for you. Thank you for being a Pinterest follower!